Drive a car, pilot a helicopter and ride a mount. Defeat 100 enemy A.l. in the Toy Box. Download a Toy Box to your device from "My Toy Boxes". Upload a Toy Box from your device to "My Toy Boxes". Become invisible, goo'd big, goo'd small and trip on a tripwire. Play as one Avatar for 20 minutes. Drive a goo'd small car, helicopter and mount. Drive a goo'd big car, helicopter and mount. Download a Toy Box from Disney's Toy Boxes. 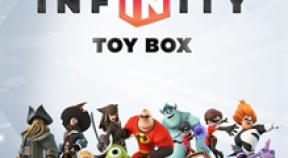 Upload a Toy Box to Disney's Toy Boxes for consideration to be featured. Save 10 worlds to "My Toy Boxes".